We believe that transparent, balanced, and timely reporting of industry-sponsored research in peer-reviewed journals fulfills an ethical obligation to trial participants while providing critical context to help physicians and patients make informed decisions. Transparent reporting also enables accurate and objective data interpretation to advance scientific understanding. Transparency is, therefore, essential to establishing the credibility of research outcomes. Views expressed are those of the individual contributors and should not be considered to represent the opinions of their respective affiliations. We know what transparency means to us...now please tell us what transparency means to you! 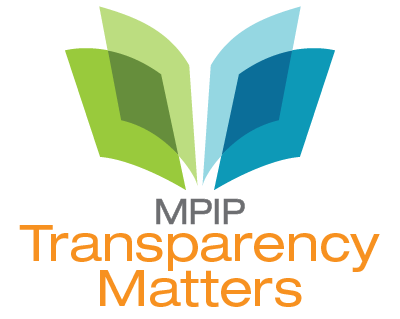 To continue to broaden the conversation around transparency and to showcase the power and importance of transparency when publishing industry-sponsored research, we will post selected responses on the MPIP website. I wish my comments to be posted with my name and affiliation. I wish to share my opinion with MPIP, but I do not wish my comments to be posted. I wish to receive updates on MPIP initiatives; please put me on your mailing list. I wish MPIP to contact me to follow-up on my comments and/or engage me further in their transparency efforts. *This information is required so that MPIP can confirm your identity before posting a response and attributing it to your name. E-mail addresses are for our records only and will not be posted. Copyright © 2011-2018 MPIP. All Rights Reserved. Thank you for sharing what transparency means to you! Your submission is almost complete, please confirm below to share what transparency means to you! MPIP will post responses as received with the following exceptions: any derogatory/defamatory content directed at an identified/identifiable individual/corporate entity will be anonymized before posting; any vulgar/obscene language/images will not be posted; any off-topic content will not be posted. Within these parameters, MPIP retains the right to exclude any content from posting. Post my comments with my name and affiliation. Do not post my comments.